During public opening days, visitors tour the Garden in groups accompanied by a guide and following a single route.The tours leave every ten minutes and last approximately one hour and it is suitable for the disabled. All visitors are expected to make an entry contribution towards the cost of maintaining the garden and ruins and providing guides. The hortus conclusus, a formal garden dating from the 17th century, is accessible on payment of a small supplement. By dedicating approximately a half day to each, there is time enough in a day to visit not only the Garden of Ninfa but also the Caetani Castle of Sermoneta, likewise a property of the Roffredo Caetani Foundation. Please note: during public opening days bilingual guided tours leave at 10.30 a.m. and at 3.30 p.m..
English-speaking or other overseas visitors wishing to tour with a bilingual guide should be at the main entrance before the tour leaves (9.30 a.m. and 2.30 p.m.) to make their requirement known. Whilst tours are conducted in Italian, between the various stopping points explanations in English will be provided. The town of Ninfa takes its name from a little temple dedicated to the nymphs during the Roman period, built on one of the most abundant springs at the foot of the Lepini Hills. These waters gave life to the original river Nymphaeus. Of the abandoned medieval town there remain today an imposing double wall and the ruins of a castle, churches, municipal buildings and many private dwellings. As in the past, water is still the key to Ninfa's survival. Ninfa had a significant economic and strategic identity as early as the 8th century. This came about due to the flooding and impassability of a stretch of the Appian Way between Cisterna and Terracina and the consequent spread of malaria. A water dam, seen to this day at Ninfa, is an example of advanced engineering from early times. The resulting lake enabled waterpower to be used to turn rudimentary machinery such as mills, olive presses, bellows and hammers for the working of metal - making a fortune for the little settlement. By the beginning of the 11th century, Ninfa had grown to the status of a small town. It continued to expand and prosper. In 1159, Rolando Bandinelli was consecrated as Pope Alexander III in S. Maria Maggiore, the largest of Ninfa's seven churches. Several papal families - among them the Tuscolo, Frangipani, Conti, and Anibaldi - fought over Ninfa which was at various times destroyed and rebuilt before passing finally to the Caetani family in 1298. 100 years of prosperity followed. As the result of papal wars and inter-family disputes, however, the town was substantially destroyed in 1382 leading to an exodus of the population and an unstoppable decay that lasted until the 20th century. In the 17th century, Ninfa was for a time used for commercial activity, for example iron-works and a tannery, or as a recreational retreat for the Caetani who then commissioned Francesco da Volterra to design the Hortus Conclusus (enclosed garden). In the 18th and 19th centuries artists and travellers regularly visited the ruined town, after failed attempts to repopulate it. Their various depictions of it left an important record of how it then was. Notable among them were Carlo and Enrico Coleman, Edward Lear, Gregorovius, Ettore Roesler Franz; and Giulio Aristide Sartorio in the 20th century. Gelasio Caetani, in the early 1920s, set out to restore Ninfa by means of a well-planned programme of research, excavation and restoration of the ruins, laying out the foundations for a garden today counted among the most beautiful in the world. With his English mother, Ada Wilbraham, the first of Ninfa’s gardeners, and inspired by Ninfa’s evocative and mysterious character, he began planting the great trees that we enjoy today. The creation of a garden at Ninfa, meaning the ability as far back as the 1920s to visualise the potential of a site completely abandoned and covered by a mantle of vegetation, is intriguing - the more so because Ninfa came back to life after centuries of neglect in the form of a garden conceived in a typical Anglo-Saxon style. The Garden of Ninfa today, with its paths spreading like sinews, is spontaneous and informal with little in the way of geometric patterns. The development and planting work continued with Ada’s American-born daughter-in-law Marguerite Chapin. She opened the garden to an important circle of writers and artists associated with the literary reviews Commerce and Botteghe Oscure, which she founded. Such friends were equally inspired by Ninfa. Marguerite’s daughter, Lelia Caetani, remains nevertheless the true artisan of the garden and in her time Ninfa took on the romantic character we know today. Lelia's gardening approach was undoubtedly inspired by her natural talents as a painter, which led her to select plants in the landscape as if at work on a large canvas. She had a natural and creative touch. On Lelia’s untimely death in 1977, ownership and responsibility for the garden passed to the Roffredo Caetani Foundation. Ninfa is well cared for. Spontaneity remains key and visitors are little aware of the human touch. Managing such a remarkable place is a difficult and complex challenge with the delicate eco-system always a foremost consideration. - the setting itself – culturally, pictorially and environmentally exceptional. Ninfa draws together history, architecture and nature. The microclimate and eco-system are rare because Ninfa sits at the juncture of two contrasting geological formations - the alluvial Pontine plain and the limestone Lepini hills. The property faces south and enjoys the benefit of pure and abundant spring waters. Though in ruins, Ninfa is a rare example of a complete medieval town. Abandoned for five centuries, it was described by the historian Gregorovius in the 1880s as the ‘Pompeii of the Middle Ages’. What we see today are the significant remains of a fortified town, encircled by a double girdle of walls, which reached its peak of prosperity between the 13th and 14th centuries. The urban layout is still clearly distinguishable, giving the garden a setting that appeals to the imagination. 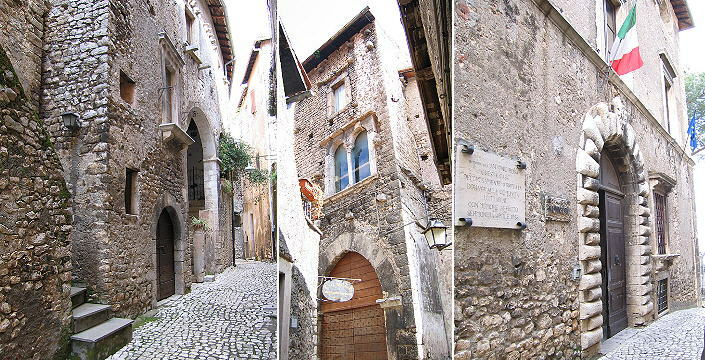 The main buildings, not all of them in good condition, are easily identified as the castle, the town hall (converted to a Caetani family house), and the churches of S. Giovanni, S. Biagio, S. Salvatore, and S. Paolo all situated along the outer walls. S. Maria Maggiore occupies a central position and S. Pietro ‘outside the walls’ stands closer to the base of the hills. Over time the Garden of Ninfa has developed a truly international plant collection. It is widely known for being both a protected monument and a nature conservation area. The Garden contains at least 19 varieties of deciduous Magnolia, along with birch, aquatic Iris and a sensational variety of Japanese maples. The early-flowering ornamental cherries blossom spectacularly. Viburnum, honeysuckle, Ceanothus, holly, Clematis, dogwoods, ornamental crab apple and tulip trees are among the many varieties, numbering over 1,300 in all, growing in the eight hectares of the garden. Many rose varieties grow along the avenues, festooning trees and ruins, bordering the river and its watercourses. In a substantial collection are to be noted varieties such as R. banksiae, R. bracteata, R. x odorata 'Mutabilis', R. hugonis, 'Ballerina', 'Iceberg', 'Max Graf', 'Complicata', 'Penelope', 'Buff Beauty', 'Mme. Alfred Carrier, R.filipes 'Kiftsgate' and 'Gloire de Dijon'. Wild flowers are much in evidence, for example anemones, cyclamen, marguerites, primulas and valerian. The particularly mild climate at Ninfa also allows the cultivation of tropical plants such as avocado, South American gunnera and banana. There are many shrubs, planted not just for their beauty but also for their value to birds and insects - for example buddleia, loved by butterflies; and cotoneaster with its wonderful berries. The presence of birds is notable, with over 100 species. They help the plant-life by controlling the number of parasitic insects. This association, founded in 2004, is fully active with nearly 250 members, some based outside the UK. A non-profit making and strictly autonomous organisation, its aim is to provide unconditional support for the garden in general and specific ways that mirror the aims of the Roffredo Caetani Foundation itself and the needs of Ninfa as a natural monument. Terracina ha conservato delle straordinarie testimonianze della sua storia . La città è sovrastata dal Tempio di Giove Anxur da cui si vede tutto l'arcipelago delle isole pontine e ha un centro storico ricco di costruzioni di epoche diverse. La città nuova si è poi sviluppata attorno al settecentesco Borgo Pio e si è andata successivamente distendosi lungo lo spazioso arenile di fronte al mare. Il vasto territorio naturale di Terracina, quello costiero, quello di pianura e soprattutto, quello collinare dei Monti Ausoni, conserva ancora molta parte di quella bellezza paesaggistica originaria; inoltrandosi per qualche chilometro si possono raggiungere la valle collinare di Campo Soriano e la Madonnina di Monte Leano che si affaccia sulla pianura pontina.